We are Robert Rijnberk and Harriet van Itallie and we live in Oudenbosch, North Brabant in the Netherlands. We show our dogs regularly and also our dogs attend the race track and coursing events, this is important for their fitness and quality of life. 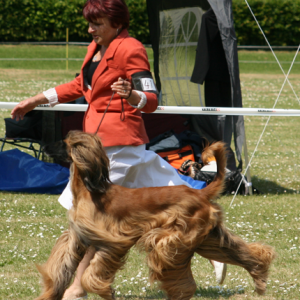 In the summer of 1976 this breed stole my heart and I have lived with them ever since, Robert came into my life 10 years ago and together we have shared our love and interest in the Afghan hound. Our Kennel name El Shariat means Holy Law. 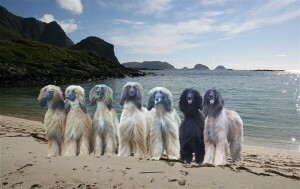 I bred my first litter in 1989 with the help and advice of others, and based on the famous Dutch vdOM lines, to which I will always be grateful. My third litter was born in 2003 and was my first litter that was based on my own decision as regards the combination of the parents. Therefore the Matriarch of my El Shariat Kennel is JW’01 Milouka Voyva Fatinat Al Sjark. 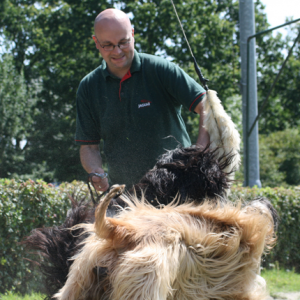 Together we hope to enjoy this wonderful breed for many years to come.